The Sprinkler Key Holder is made from a real sprinkler system head so it looks real and no one will ever suspect your hiding place. Whether you are keeping an extra key handy for yourself or leaving money or small documents for someone else, this is the ideal outdoor safe spot. 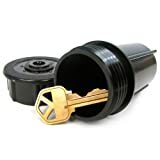 The Sprinkler Key Hider is waterproof and virtually indestructible.